Homesteading Space: The Skylab Story. 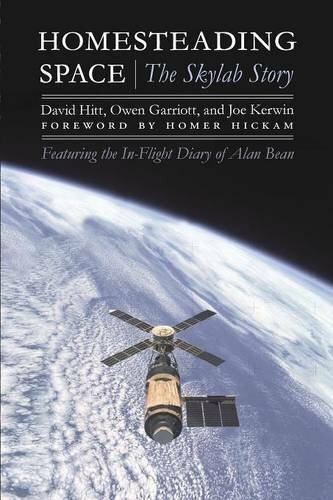 By David Hitt, Owen Garriott, Joseph P. Kerwin, with the diary of Alan L. Bean. University of Nebraska Press, Lincoln, 2008. ISBN-13: 978-080-3224-34-6. 548 pages. $29.95. Accounts by astronauts are sometimes entertaining, sometimes insightful and reflective, sometimes revealing, and sometimes inspiring. A very few accomplish all of those goals. Perhaps the gold standard for this is Apollo 11 astronaut Michael Collins’s Carrying the Fire. While Homesteading Space is not the same thoughtful, perceptive account as Carrying the Fire, but it is a worthy recollection of an important but largely forgotten program. It tells a significant part of the story of the Skylab orbital workshop, the first American space station launched in 1973 and occupied through the middle part of 1974 by three crews of astronauts. Owen Garriott, Joseph P. Kerwin, and Alan L. Bean were all astronauts that flew aboard Skylab and with the help of journalist David Hitt Homesteading Space does a credible job of telling their story. A 100-ton orbital workshop launched into orbit with the last use of the giant Saturn V launch vehicle in May 1973. Almost immediately, technical problems developed due to vibrations during lift‑off and the first crew to fly, astronauts Pete Conrad, Paul J. Weitz, and Homesteading Space co-author Joseph P. Kerwin, had to resolve them and make Skylab operational. That first group of astronauts returned to Earth on June 22, 1973, and two other Skylab crews followed, one each with co-authors Garriott and Bean. All three crews occupied the Skylab workshop for a total of 171 days and 13 hours. It was the site of nearly 300 scientific and technical experiments. In Skylab, both the total hours in space and the total hours spent in performance of EVA under microgravity conditions exceeded the combined totals of all of the world’s previous space flights up to that time. Skylab was the first real test of long-duration spaceflight undertaken by the United States. Homesteading Space is a useful personal recollection of three astronauts who flew on Skylab. It is a welcome account of a lesser known program. This entry was posted in History, Space and tagged Alan L. Bean, Carrying the Fire, David Hitt, Homesteading Space: The Skylab Story, Joseph P. Kerwin, Michael Collins, Owen Garriott, Paul J. Weitz, Pete Conrad, Skylab, University of Nebraska Press. Bookmark the permalink. Bean and Garriott flew together with Lousma on the second mission (Skylab 3). Carr, Pogue and Gibson flew the final mission (4).